This year marked a turning point in how Europe presents its history and culture. The European Union designated 2018 as the “European Year of Cultural Heritage.” This represents a drastic change in Europe’s perspective about its past. Since World War ii, Europe has been generally timid about its history and culture—but no longer. Europe shares a common cultural heritage. That heritage was established by Charlemagne, the late eighth-century emperor of the Holy Roman Empire. He and other self-proclaimed Christian emperors shaped what became Europe’s culture today. This shared heritage united Europe for centuries. But seemingly paradoxically, the same heritage also caused the death of millions. Nonetheless, it is this heritage that European leaders seek to revive again—on the largest scale ever! This heritage is not a theoretical concept floating around in the minds of European elites. Historically, it has been the most practical and effective way to unite European citizens under one government for one cause. With Berlin as a strong driving force, Europe is again reviving its cultural heritage at all levels. Each member state has appointed a national coordinator to implement the year and coordinate events and projects at a local, regional and national level. Key stakeholders from the cultural sector as well as civil society organizations are closely involved in the year’s activities. At the European level, all EU institutions are committed to making the year a success. The European Commission, the European Parliament and the Council of the European Union, as well as the Committee of the Regions and the European Economic and Social Committee, will organize events to celebrate the year and launch activities focusing on cultural heritage. In addition, the EU will fund projects supporting cultural heritage. A dedicated call for cooperation projects relating to the year has been launched under the Creative Europe program. A wealth of additional opportunities will be available under Erasmus+, Europe for Citizens, Horizon 2020 and other EU programs. You can follow the events through Twitter hashtags such as #EuropeforCulture, #SharingHeritage, #EuropeanYear, #EYCH, #BerlinCallToAction, #religiousHeritage, #Kulturerben and a lot more. You can also learn more about Europe’s effort to promote culture on its website. The European Year of Cultural Heritage is literally affecting Europe at all levels of government, down to individual citizens. Perhaps you’re skeptical about this statement, just as I was before I researched it. But don’t brush it off as an exaggeration. The undertaking is more successful than you might think. The website states that so far, 37 countries have organized 11,500 events, involving more than 6 million participants. You can click through the website and find links to each participating country and corresponding events in various cities, towns and local communities. You can find dozens and dozens of websites and articles promoting and reporting on these cultural heritage events. But what is this initiative really about? This cultural revival is taking place in entire nations, cities, towns, cathedrals, museums, castles, monuments, schools, artists, craftsmen and townspeople. Beyond that, it will ultimately affect the entire world—and you. Europe’s cultural heritage has a lot to do with Europe’s Christian heritage. Trumpet editor in chief Gerald Flurry has explained that when European leaders talk about culture, they are really talking about the Holy Roman Empire. It is the culture of that empire that Europe seeks to revive. European culture and religion are inseparable. The emperors of the Holy Roman Empire Christianized much of Europe’s culture. The prime example of this is the Aachen Cathedral, which united artistic and architectural skill from across Europe into one building. For this reason, the cathedral was honored as Germany’s first United Nations Educational, Scientific and Cultural Organization World Heritage site. Aachen Cathedral Provost Manfred von Holtum says, “Being a Christian is culture.” If someone in the Middle Ages wanted to learn about culture, he had to go to the Catholic Church. The cultural revival today leads people to the Christianity of the Holy Roman Empire. Being a Christian is culture. And this can go both ways: Christianity established culture; here in the Aachen Cathedral through worship and prayer, through pilgrimages and the very different expressions of religious activities, through music and cathedral tours, through readings of contemporary literature and through celebrations such as the awarding of the Charlemagne Prize or the Medal for Combating Deadly Seriousness [awarded during Carnival]. But it is also true that culture is a path to religion. How many people are brought into contact with religion—the Christian religion—each year by visiting this church, for the first time or after a long period of religious abstinence or after a break away from one’s own Christian past? Like the celebration in Aachen, many of the European cultural heritage events promoted in 2018 have not only deep historic significance but also great religious relevance. For example, people who attend these events are taught about the role churches played throughout the centuries, why certain saints are honored, and what role religion plays in Europe today. Other places and events emphasize historic links. At Nuremberg Castle, you can learn about the former glory of the Holy Roman Empire and why Hitler found his inspiration there. We, the undersigned citizens, organizations and institutions … stand ready to take up our shared responsibility to unfold the cohesive power and potential of our shared cultural heritage to advance a more peaceful, prosperous, inclusive and just Europe. Today, in this European Year of Cultural Heritage, we have a unique opportunity to influence the debate on the Future of Europe. Confronted with so many challenges, and even threats, to core European values, this debate cannot be based exclusively on political, economic or security considerations. We must “change the tone” of the narrative about Europe. We must put our shared cultural heritage where it belongs: at the very center of Europe’s policies and priorities. Berlin wants to unleash “the cohesive power and potential of [Europe’s] shared cultural heritage.” It is that culture that Charlemagne used to unite Europe. He was the instigator of the very first Europe-wide cultural revival after the collapse of the Roman Empire, a revival that later became known as the Carolingian Renaissance. 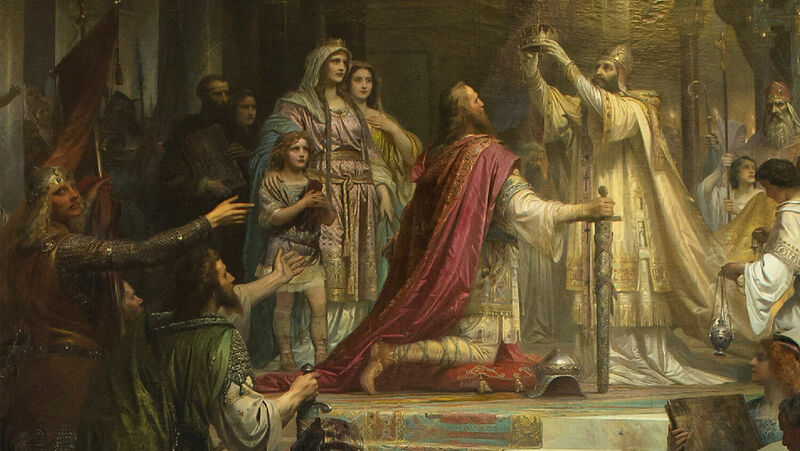 Charlemagne’s greatest success (as European leaders call it) was establishing a Christian culture that combined Greco-Roman tradition with Catholic tradition. Charlemagne learned from his father that only by using the Catholic Church would he be able to instill a common identity in Europe and unite his subjects. It was also only through this church-state combine that he could motivate his citizens to fight for a “higher cause.” There is no other way to explain the fact that Charlemagne motivated his soldiers for 30 years to force the people of Saxony to convert to Catholicism, using torture methods that had never been used before. Without Charlemagne, Europe would not have a common cultural heritage. Without Charlemagne, Europe as we know it wouldn’t even exist. Therefore, it shouldn’t come as surprise that Charlemagne has also been greatly venerated during the European Year of Cultural Heritage. “Beyond doubt, #Europe is united through its arts and culture”, said Federal Minister for the EU, Arts, Culture & Media @Gernot_Bluemel at the opening of the #eu2018at “Museum in a Nutshell” exhibition. A trend is unfolding in Europe that you should keep a close watch on. Europeans have been besieged by immigrants from the Middle East, growing Muslim populations within their midst, cityscapes filling with mosques and minarets, portions of their cities turning into Muslim enclaves that local police dare not enter, even Islamic terrorist attacks. And more and more Europeans are looking for solutions in their own history. Specifically, their religious history. If you know that history, this should be alarming! Request a free copy of our book The Holy Roman Empire in Prophecy and read Mr. Flurry’s article “The Holy Roman Empire Goes Public—Big Time!” to learn what this history is all about. You need to know! Cultural heritage must be given a much bigger importance in educational activities—both formal and informal—for all ages. This will stimulate stronger public engagement for the safeguarding and transmission of our cultural heritage. Special attention must be given to history education and heritage interpretation placed in a broader context of Europe’s past, present and future. This will equip Europe’s citizens and especially our children and the youth, with the necessary tools for gaining a deeper understanding of the ongoing encounters and exchanges within Europe as well as between Europe and other cultures of the world. All of these activities will help build more respectful and meaningful relationships between people and the places where they live, work or visit. This will also facilitate a better understanding, respect and inclusion of new inhabitants in Europe. This is a direct call to all European citizens to remember their history, specifically the history of how Europe encountered other cultures in the past. But exactly how did Europe encounter other cultures? Yes, the Holy Roman Empire did indeed “encounter” many other cultures during its centuries-long rule. But what were the results of these encounters? Europe’s cultural revival did lead to a better “inclusion of new inhabitants in Europe,” but that was only true if they converted to the culture and religion of the Holy Roman Empire! The pagans in Europe were different from Charlemagne’s Christian Greco-Roman culture. The emperor’s response to their culture was to convert them by the sword. Either they converted to European culture and religion, or they died. Another culture continually present in Europe was that of the Jews. The Holy Roman Empire responded to Judaism in Europe with persecution. When Islamic hordes tried to instill their culture in Europe, Roman emperors and popes repeatedly responded by calling for military crusades to fight off the invaders. Yet another encounter came with the Protestant Reformation. How did leaders of the Holy Roman Empire respond to that religious challenge? I think you know the answer. If not, study the history of one of the most bloody conflicts in human history, the Thirty Years’ War. Think about the terrible inquisitions and unprecedented bloodshed that were committed by the Holy Roman Empire, and you might wonder: Why does Europe want to revive this culture? Did people at the time of Charlemagne know that his cultural programs were part of his plan to subjugate the world? Probably not. But once he implemented the programs, people were willing to fight for their cultural heritage and for the empire. This same empire is again rising from the ashes. This cultural and religious revival in Europe shows that the Catholic Church is again gaining control over Europe. But just like in centuries before, not everyone will support that movement. Many people have moved away from the Catholic Church, protesting against it or abandoning religion altogether. What does the Bible say about this last resurrection of the Holy Roman Empire? This church-state combine will gain almost total power over people. It enforces its mark. Many people believe that this “mark of the beast” is a physical mark of some kind. But, as Who or What Is the Prophetic Beast? explains in detail, it is a sign—a sign that revolves around the day you worship God. It has to do with one of the Ten Commandments: “Remember the Sabbath day, to keep it holy.” But this religious-political power has enforced and will enforce its day of worship. We are seeing this church-state union rising in front of our eyes! The European Union is promoting religious events again, on the largest scale ever! Anyone who does not accept this cultural revival, which will soon include Sunday worship, will face the greatest persecution mankind has ever seen. Where is Europe’s 2018 Year of Cultural Heritage leading? A study of history and staying current with the news will help, but if you want to know the outcome of these events, you must consider prophecy. Request Who or What Is the Prophetic Beast? to help you in that study. Book after book shows that culture played a crucial role in the history of the Holy Roman Empire. Those same history books outline crusade after crusade, inquisition after inquisition, and persecution after persecution. It developed torture instruments, sunk to deeper levels of perversion, and engaged in many other evils. Great intellectuals dedicated their lives to slaughtering those who believed differently. This history is horrifyingly bloody—but the worst is yet to come. God allows this empire to rise to bring the modern descendants of ancient Israel and ultimately the whole world to repentance—away from a sinful lifestyle and toward a life of true happiness and abundance. You can repent today and avoid the terrifying punishment that awaits the world. To learn how, study Repentance Toward God and How to Pray. It’s an unhappy, restless world in frustration, staring a hopeless future in the face. It’s a world ridden with escalating crime and violence, immorality, injustice (even in its courts of law), dishonesty, corruption in government and business, and continual wars, pointing now to the final nuclear World War iii. Why this paradox of “progress” amid degeneration? Unlike the philosophers of the world, Mr. Armstrong found the answer revealed in the pages of the Bible. The answer to this question is the key to understanding a mystery that has puzzled this world for centuries. The answer entails the most hope-filled revelation that you could ever hear of. The answer is there for you. Request your free copy of the book that solves life’s most basic mysteries and unlocks the Bible: Mystery of the Ages.